There’s nothing worse than lying awake on a warm summer’s night, sweltering hot despite the fact that you’ve got the windows wide open and the fan right next to your head. 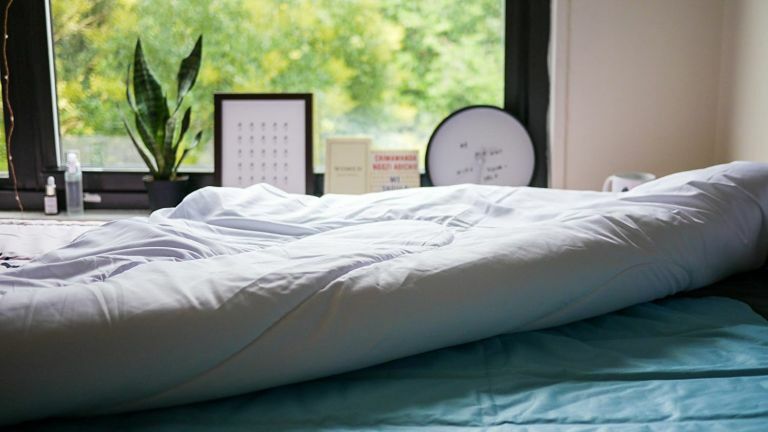 While a memory foam mattress is ultra comfortable, it is has a habit of retaining your body heat, which, unfortunately, when you’re already sweating buckets under the duvet, doesn’t do anything to help cool you down. The best mattress cooling pads, such as our top pick the Gel Fusion Memory Foam Mattress Topper from Dunelm Mill,use cooling gel to dissipate heat, rather than retain it, and still provide you with the support you need from a mattress. Other than that, you’ll need consider the thickness of your cooling pad – you don’t want a princess and the pea effect going on in your bed, but you don’t want to compromise on comfort, either. Also consider firmness – the firmer it is, the more cooling it will be. Investing in mattress cooling pad can be more cost-effective than purchasing a brand new mattress. If you like the idea of memory foam but you’re apprehensive about the heat factor, this gel fusion mattress is a great compromise. The gel particles absorb and disperse body heat while the tiny air holes in the topper increase airflow and breathability to ensure you remain cool and comfortable on even the hottest nights. Thin in comparison to our first pick, this gel pad is the perfect topper if you don’t want to override the comfort level of your existing mattress. The gel works to disperse the heat away from your body. It doesn’t retain heat in one spot, but redistributes it, so it should keep you cool all night. Doubling up as an ice pad for the injured and a heat pad for the cold, this is an incredibly versatile buy. It may not be as attractive as our first pick but if you’re looking for all the support and coolness that a gel mattress can give you without the hefty price tag, this orthopaedic one from Gelify should do the trick nicely. In addition to contouring to your body shape, it retains less heat so its not radiating your own body heat back to you, keeping you cool and comfortable all year round. Not everyone gets on with the idea of gel, so it’s worth looking at this microfibre offering from Silentnight. This cooling pad or mattress topper won’t offer the same level of support as thick gel but it will provide that additional layer of comfort with coolness in mind, thanks to its breathability. If you do happen to get a bit sweaty one night, you can stick this mattress topper in the washing machine; all in all, a great way to a fresh bed all summer. There’s nothing better than the cool side of the pillow on a warm night but when it’s so warm there’s just no cool side anymore, at least you have this gel pillow cooling pad to rely on. Simply place it under your pillow case and the gel will disperse your body heat to ensure your head remains cool and dry. Apparently, it’s also pretty good to use when you’re suffering with a headache or a sunburned forehead!